"Zack and his crew painted the inside of our home. From the bid to the clean up, these guys were great. Very professional and easy to work with. I would recommend them to anyone. They were quick, clean, and responsibly priced. Our house looks great now! Thank you guys!" "I was in a tight spot, we needed the interior of our home painted prior to us moving in...needed it started the next day and finished in two. They knock it out within our time frame, at a reasonable price, worked efficiently and turned out a great product. Their team worked together well and are a great residential interior painting contractor. My wife and I highly recommend Carmel Construction and will definitely be using them more in the future . " "You can trust Jay and his company to take care of your home's needs with integrity and courtesy. We had a slab leak that called for repairs...Jay came to the rescue and took care of the drywall, baseboards, paint and carpet. All better. " "No surprise that Jay and his crew at Carmel Construction get 5 stars from everyone! We hired them to re-paint the living areas of our 40-year-old house, re-texture some places, and replace baseboard. Incredibly conscientious, left the site clean every day, dealt with dogs. Definitely would recommend and will use again on the next project." "Jay and his crew did a FANTASTIC job! My husband and I are completely satisfied and pleased with the finished product. In addition to a beautiful finished product that improved the look of our home, these are some other things that I liked about this company: 1. Jay took extra time with us at the beginning of the project, explaining the process and listening to our ideas. 2. He was on the job to oversee the work everyday. 3. During the process Jay continued to talk with us and give valuable advise, (which we took), resulting in a design that was creative and aesthetically pleasing." We wanted a complete overhaul of our backyard. Carmel Construction planned and executed everything we wanted and the outcome is beautiful! Originally, there were a few options we considered, including concrete vs pavers and a fire pit. We had a few ideas and different bids, but Jay came through with the best design at a fair price and most importantly, high quality work. One of the things many homeowners under-estimate is the quality of the staff and timeliness of the work, and in both cases, Jay's team was outstanding. Probably the biggest challenge was to match the existing pavers and to integrate new ones in to a seamless transition. Jay was able this and only we would know where the seam between the two exists. He also very wisely suggesting putting down a coat of dog proofing before adding the hardscape. Very professional, reliable, and responsive. Carmel Construction is highly recommended. I worked with Jay Richardson and Carmel Construction Services on a full interior/exterior remodel...the scope of the interior work was a complete gut of the kitchen, bathrooms, living room and bedrooms with work performed included demolition, drywall repair, texture, paint, electrical, plumbing, tile, cabinets, counter installation, fireplace redesign, window replacement, vinyl flooring installation, etc. The scope of the exterior work included paint, fascia repair, window trim, as well as landscape including sprinkler, gravel and seed installation. Jay was honest, hardworking and truly cared about the job. He went above and beyond to insure that the final project met our expectations and that the condition of the property would generate maximum rental income. He is good with his paperwork (which is often rare with contractors) and with keeping the job on budget. I highly recommend Jay and Carmel Construction Services and plan to use him again for future projects. Carmel Construction provided an amazing service and end result when installing wood floors at my residence. Due to the exceptional work provided by Jason, I have hired Carmel Services for additional home improvements: Drywall, baseboards, carpet, and plumbing repairs. Jason is a person of high character who takes great care in his work." "I could not express how happy we are with the choice we made to invest in re-doing our back yard, and even more in our choice in choosing to use Jay w/ Carmel construction. From the very beginning I knew we were in good hands. Jay & his company truly care about getting it done right, even if it costed them a little extra work or time. I knew they were not going to take shortcuts. I also could feel that Jay was on the side of the homeowner along the whole process. As homeowners our only job was to make final decisions of how we wanted things. Our yard is breath taking! I feel like I'm on a vacation every time I walk in the yard. We have three big dogs who love to run, dig and climb. Pre Carmel Construction our yard was all dirt, and non-functioning. Jay's team understood that our main concern was that we would make a yard that we could enjoy with our pets and they could not destroy when we were gone. They did an excellent job of meeting all our expectations and more. Our yard is now an oasis of stones, beautiful trees, plants, fountains, and artificial grass (but it looks so real, you would hardly know it). Thank you Jay! "We had a strict timeline and budget, Carmel Construction did an amazing job with time to spare. They worked with other companies in arranging the timing of everything, including tree installation by a local Nursery and working with SoCal Edison Company. We didn't have to do anything but pick our pavers. Always on time and always cleaned up before leaving. Would definitely use Jay & his crew again in the future. " "Jay did paver stones for our driveway a few months back. What a job he did. The crew worked hard and got the job done a day before they were supposed to. It is the first construction job that I have ever seen that finished early, and didn't sacrifice quality. I will send anyone I know to him for this type of work." "I can't say enough about Jay and his team. He's the real deal - an honest contractor who does quality work at fair prices and really cares about his customers. Carmel Construction has done several jobs for us - most recently our Balboa Island home. They arrived on time and prepared, got the job done when they said they would, and did the "small things." It really looks beautiful. Jay answers your calls, takes you seriously, and does what he says he'll do. You can't ask for more than that. 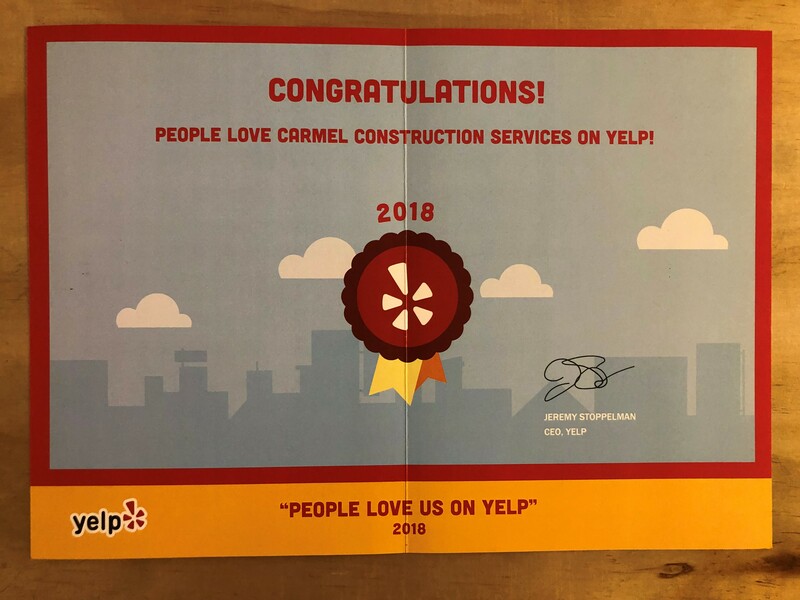 Carmel Construction gets our "5 Star" recommendation. Carmel Construction installed laminate wood flooring in our house. Jay is friendly and knowledgeable and the professional installation was done quickly and efficiently. Jay is a true expert and had all the right tools for the job, especially for some difficult thresholds. I appreciate his smart planning and attention to detail from start to finish. The floor looks fantastic!